Over the years, the art of tattooing has become a popular form of artistic expression among Americans. However, the workplace often frowns upon the appearance of tattoos. Additionally, poor artwork or personal evolution may cause tattoo lovers to become regretful of having scarred their skin. Correspondingly, there has arisen a need for more professional tattoo removal services. 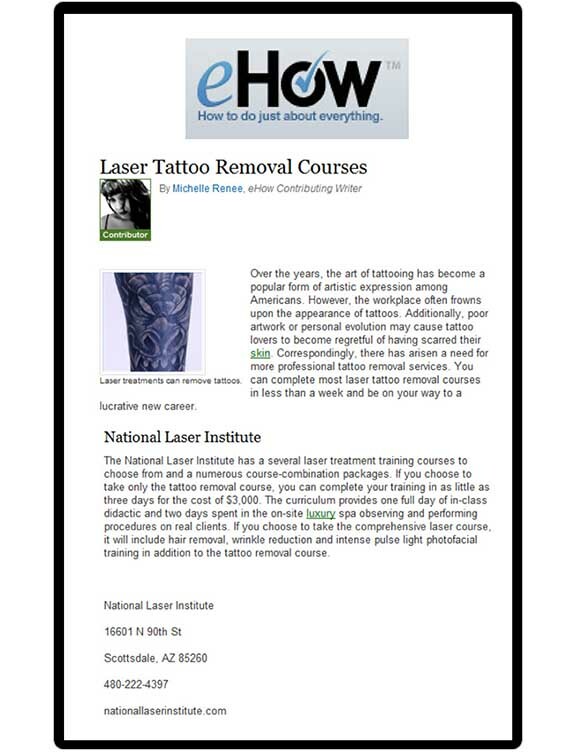 You can complete most laser tattoo removal courses in less than a week and be on your way to a lucrative new career. The National Laser Institute has a several laser treatment training courses to choose from and a numerous course-combination packages. If you choose to take only the tattoo removal course, you can complete your training in as little as three days for the cost of $3,000. The curriculum provides one full day of in-class didactic and two days spent in the on-site luxury spa observing and performing procedures on real clients. If you choose to take the comprehensive laser course, it will include hair removal, wrinkle reduction and intense pulse light photofacial training in addition to the tattoo removal course.